I have been making food for myself to bring along as snacks on my upcoming trip to Israel, and I've been trying to create a variety for myself so I don't get totally sick of one thing. I used to love crunchy granola in my pre-celiac days, and now that I've started eating oats again, I wanted to try to create my own granola. 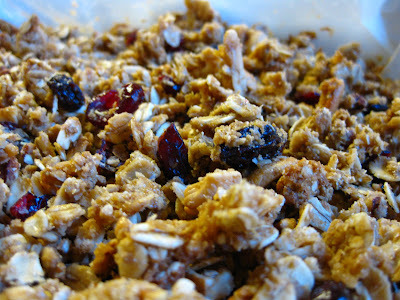 My first attempt at granola was good, but it was more like muesli; it wasn't crunchy and didn't clump together at all. So this time, I used sunbutter and maple butter to add thickness and stickiness, and it turned out beautifully. It made the whole apartment smell wonderful, and it tasted absolutely delicious. The maple butter and honey added a touch of sweetness, but the sunbutter filled out the taste and texture and balanced that sweetness. I will be making this often! **You can substitute any other dried fruit, nuts, or seeds of your choice - this would be great with: sunflower seeds, pumpkin seeds, peanuts, slivered almonds, dried cherries, etc. Preheat oven to 300 F. In a large bowl, combine the oats, coconut flakes, cashews, pecans, raisins, cranberries, and cinnamon. Add any other nuts, seeds, etc. that you would like and mix well. In a small saucepan, combine the sunbutter, maple butter, honey, and vanilla and heat until melted. It will still be pretty thick. Pour it into the bowl with the dry ingredients and mix very well until the heated mixture has been spread throughout the mixture. I used two spoons and sort of chopped the chunks of sunbutter into the oats. Line a baking dish with wax or parchment paper. Pour the mixture into the pan and bake at 300 F for 30 - 40 minutes. The granola will still feel soft when you take it out of the oven, but it will harden as it cools. maple butter rocks the house!